Through their monthly donation effort, Blue Water Grill (BWG), along with their sister businesses, The Phoenix and Wine De Vine, raises funds to assist the San Pedro community in many great ways. 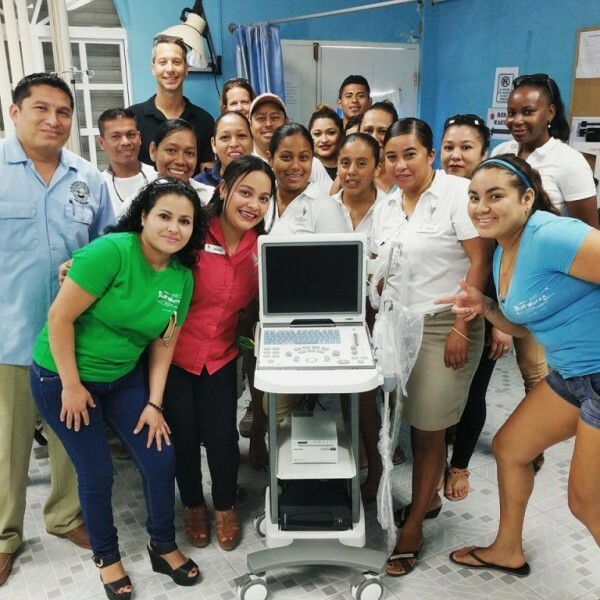 Thanks to the generosity of donors, March saw San Pedro High School (SPHS) receiving new laptops, Oceana in Belize receiving a sizeable check, and Dr. Otto Rodriguez San Pedro Polyclinic II receiving their long-awaited ultrasound machine. Thirty new Lenovo laptops were handed over to SPHS on Wednesday, March 22nd. As the school’s previous computers were not fully functional, and students often experienced technical difficulties, BWG dedicated January and February 2017 to collecting donations. BWG customers donated $5,004, guests of The Phoenix donated $2,685, and customers of Wine de Vine donated $182, which raised a total of $7,871. As per usual, BWG matched those funds, bringing the grand total to $15,741. SPHS Teacher Paul Kelly said that the new laptops will definitely benefit the school, especially for students enrolled in the San Pedro Adult Continuing Education (SPACE) program. “With over 900 students at SPHS, San Pedro Junior College (SPJC), and SPACE, these computers will also really become handy for all students. However, I noticed that the majority of the SPACE students work in the construction field. Instead of them just working in that industry as a laborer, I believe these students can become more than that. They could become more acquainted with technology and be the mastermind behind the construction,” said Kelly. Kelly also stated that he is looking to launch a computer drawing program for the next school year. “We had started a pilot program this year called Autocad…[but] our old computers were eight years old, and they couldn’t withstand the size of the Autocad program. There was always technical difficulties, and the computers frequently froze. However, SPHS will be building a room for these computers so they are well-kept, and used properly, and we are looking to restart the program during the next school year. I really thank BWG, The Phoenix, and Wine De Vine for their generous support,” said Kelly. 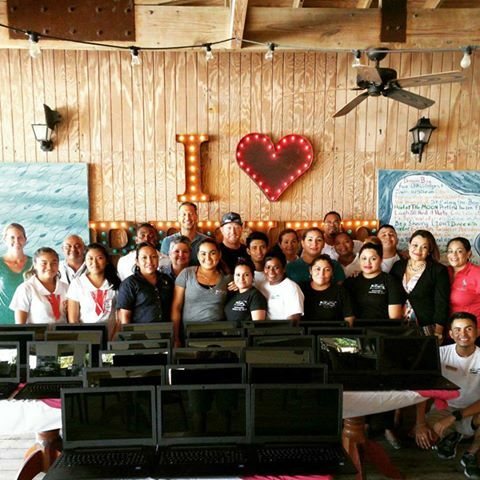 Oceana in Belize was the recipient of a $10,000 check on Friday, March 24th. The funds were raised in January 2017, when BWG hosted their first annual “Belize Food and Wine” event. The event included two nights of great food, wine and cocktails, and featured four visiting chefs from across the USA, local chefs, three sommeliers, and one cocktail expert. BWG owner Kelly McDermott Kanabar told The San Pedro Sun that she supports Oceana’s initiative to ban offshore oil drilling. “We chose to donate to Oceana so they can keep up the good fight. We want them to help us convince government that we need a law banning offshore drilling. Not only because we live off of the sea, but became oil drilling has a lot of negative impacts,” said Kanabar. Vice-President Janelle Chanona received the check on behalf of Oceana Belize. “This is a real case study of just how sensational San Pedro is. This community, like other coastal communities, knows the number of livelihoods that depend on the sea. We are really grateful to the entire community, and BWG for making us the first beneficiaries, because we can only advocate through support,” said Chanona. Chanona explained how Oceana will utilize the donation. “We work on a campaign basis, and to have that internal endorsement is crucial. This donation helps us get our work out, we really need all of these benefits to be safeguarded. This year is focusing on oil, and we will use the funds to reach out to fishing communities. We want to make sure people have the latest information and become engaged, pushing for transparency, engagement so that this is a collective decision, because whatever decision is made at sea, will affect all of us,” said Chanona. An initiative to provide Dr. Otto Rodriguez San Pedro Polyclinic II with an ultrasound machine became a reality on Monday, March 27th. From October through December 2016, customers of BWG, The Phoenix Resort, and Wine de Vine donated $16,325, which BWG matched, and purchased the ultrasound machine for $32,649.48. On hand to receive the donation was Administrator Owen Vellos and his team of nurses and technicians at the clinic. Vellos shared his gratitude for the new addition to the polyclinic, and hopes that this machine can provide patients with an affordable option. In the past, BWG has maintained a positive relationship with the polyclinic, donating an x-ray machine, an electrocardiogram (EKG) machine, many medical supplies, and even successfully lobbied for the clinic to provide 24-hour care.